HUNTINGTON BEACH, CA--(Marketwired - November 03, 2016) - Independent creative agency Grupo Gallegos announced today that it has been named creative and strategic agency of record (AOR) for NEXjet Corporation, the full-service jet charter and aircraft management company based in Long Beach, Calif.
Grupo Gallegos will be responsible for providing strategic and creative services for NEXjet Corporation, as well as heading up the company's digital communications through website development and interactive campaign work. 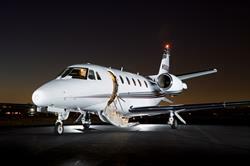 The agency will be tasked with targeting high-profile travelers and private aircraft owners looking to charter their jets. "The private jet charter industry is growing rapidly and the potential for companies like NEXjet knows no bounds," said John Gallegos, Founder & CEO of Grupo Gallegos. "We are confident that our ability to develop truly creative and strategic communications will showcase the bespoke and convenient travel experience NEXjet provides consumers." NEXjet was founded in 2007 by John MacMillan and Tom Reed on the principle that luxury travel is more about subtle elegance -- creating a tailored experience centered on ease and convenience, rather than amenities. For nearly a decade, the company has been dedicated to assisting customers with their private aircraft charter needs for business and leisure jet travel. The company operates aircraft management to more than 5,000 destinations across the U.S., as well as Canada, the Caribbean, Central and South America. "Grupo Gallegos' dedication to helping brands maximize growth, along with its deep understanding of digital and social media, will be invaluable as we set out our expansion in the travel space," said MacMillan. "I am certain that Grupo Gallegos will help ensure that there's no limit for the future of our brand." This announcement comes on the heels of several other new business wins for Grupo Gallegos. Earlier this year, the agency was named digital and social AOR for Hass Avocado Board and lead creative AOR for Coronado Brewing Co. Founded in 2001 by CEO John Gallegos, Grupo Gallegos is a creatively-driven culturally attuned agency dedicated to providing clients with strategic marketing solutions that push the boundaries creatively and propel business growth. Known for being the most culturally astute agency in U.S., Grupo Gallegos counts on Comcast, California Milk Processor Board (Got Milk? ), Alzheimer's Association, Hass Avocado Board, TurboTax, KIA, Coronado Brewing Co., and Foster Farms as clients, to name a few. Recognized for its inventive work, Grupo Gallegos has received several honors, including being named as one of Advertising Age's Agencies to Watch in 2015 and Multicultural Agency of the Year in 2007. The agency was also previously awarded Adweek's Hispanic Agency of the Year in 2006. For more information, please visit grupogallegos.com. NEXjet Corporation is a full-service, jet charter operator based out of Long Beach, Calif. The company was founded in 2007 by John MacMillan and Tom Reed to accommodate the needs of a growing, high-profile clientele seeking personalized and convenient travel services. NEXjet Corporation's dedicated charter department assists customers with private jet travel arrangements, guaranteeing exceptional service and an outstanding travel experience. For more information, please visit NEXjet.com.